Researchers have identified measurable effects of exercise on the gut microbiome in mice, according to a study published in mSystems. In "Moderate Exercise Has Limited but Distinguishable Effects on the Mouse Microbiome," researchers at Dalhousie University, Canada, compared gut microbial diversity and changes in exercise-associated inflammatory markers over an 8-week period in sedentary mice and mice that performed either voluntary or moderate forced exercise. They found levels of inflammatory markers to be similar for the mice in all three groups. Likewise, traditional microbial profiling comparing operational taxonomic units (OTUs) and multivariate analysis of beta diversity did not reveal any significantly different taxonomic patterns between the voluntary or forced exercise group compared to the sedentary controls. Interestingly, however, a random forests machine learning model — which takes into account the relationships between bacteria in a community — could classify voluntary exercisers and non-exercisers with a 97% accuracy. 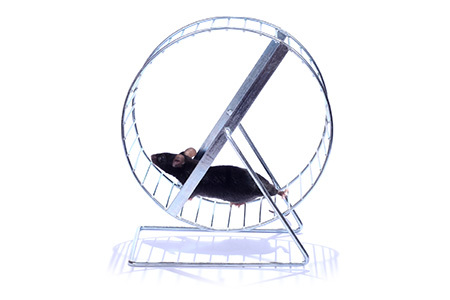 Altogether the results illustrate that exercise has a moderate but measurable effect on gut microbial communities in mice.